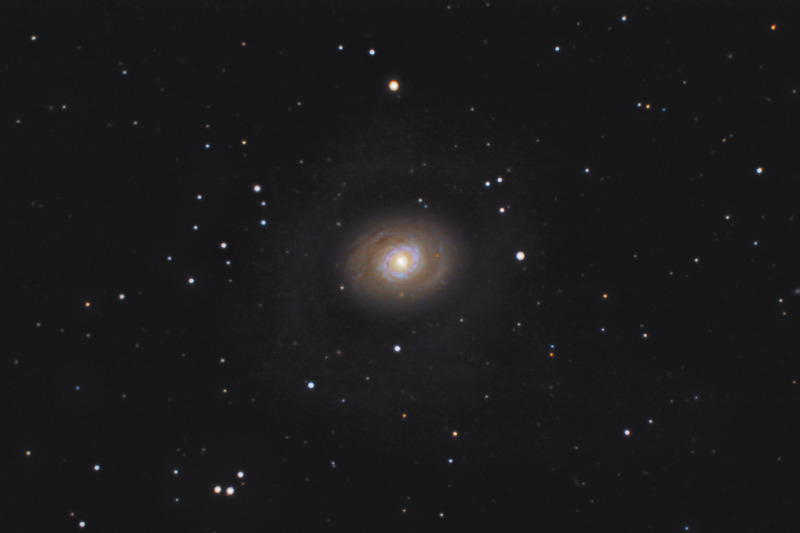 M94 is a colorful spiral galaxy with an apparent diameter of about 11' x 9' (roughly 1/3 the apparent diameter of the Moon in the sky). Commonly referred to as "The Cat's Eye Galaxy", M94 is known as a "Starburst" galaxy due to the the bright bluish ring which indicates a period of rapid star formation. The different regions of M94 vary dramatically in brightness, from the very bright core, to the faint outer ring. Software Used Images Plus 4.0 for camera control, calibration, stacking, digital development, and multiresolution smoothing Photoshop CS5 used for color correction, leels and curves, star shrinking, saturation adjustments, noise reduction, and high pass filter. HLVG for additional color correction, and Carboni Actions for additional saturation adjustments and noise reduction. Notes This is a beautiful galaxy, and I'm pretty pleased with my results on this one. Someday I'd like to add some H-alpha data to this image in order to further bring out details in the spiral arms.